Gettysburg. It’s the granddaddy of all the Civil War battlefields in the United States. 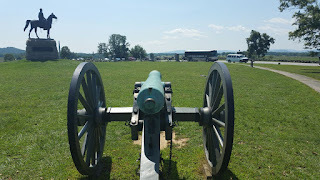 We spent a portion of Sunday touring the battlefield and visiting the new visitor’s center. We had plans in place to be in the area long before the troubles in Charlottesville and other areas where there are statues venerating Confederate generals. While, in the back of my head I had some doubts about the wisdom of making this stop in the midst of all this social turmoil, we did not see anyone protesting the statues anywhere on the battlefield. I have thought long and hard about what I wanted to say about the status of Confederate statues throughout the country. It is definitely a hot button issue that has many facets to it. I made a few comments on a friend’s social media post in the aftermath of the riots in Virginia, and I quickly regretted it. One of the problems I see, and I’m not even talking about the statues themselves yet, is our collective incapability to see issues in anything other than black and white. We seem to be in two camps: tear them all down, or keep them all. Probably the biggest, and most inaccurate argument being made is “they’re tearing down history.” I respectively disagree with that, and I will explain why. I also disagree with the idea that there are no place at all for these monuments. Again, I will explain why. There is a place for these Confederate monuments. Battlefields like Gettysburg, Antietam, the Wilderness, and others are the right place, along with museums about the Civil War. In these places, their stories can be taken in the context of the conflict as a whole. The people represented by these monuments do have a story to tell, even if it’s uncomfortable. Especially if it is uncomfortable. Their history, combined with that of the Union generals, tells the whole tale. Keeping memorials on the battlefields and in the museums will explain to us what happened, why it happened, and why it should never happen again. In my opinion, there is no wiggle room on this aspect. As for the memorials that have been erected in public spaces solely for the veneration of a single Confederate combatant, I have a real issue. First of all, these monuments are taken out of their historical context. They’re not telling us anything other than these people once turned traitor to their country to defend the peculiar institution. Putting them in the public square is an implied acceptance of their actions. These men should not be worshiped. Unfortunately, that’s what has happened. Some friends of mine tried to tell me that removing the monuments is erasing history. As an historian, I can most assuredly tell you that it is not. We still have monuments to the Civil War as a whole in places like Gettysburg, and museums across the country. That should not change. In fact, they should become even more important in telling our history, reminding us that once upon a time we had disagreements so fierce that we took up arms against one another. They should be a reminder that it should never happen again. In today’s political “Us vs. Them” climate, that message should be ever far-reaching. At the same time as a society, we should move beyond xenophobia. As President Obama tweeted earlier this week (and, yes, I know he’s not the first to say it), no one is born hating someone over the color of their skin. In a supposedly civilized 21st century, we should be well beyond thinking racism is okay. Keeping Confederate memorials in a town’s public square flies directly in the face of that. These monuments should be removed from the public square and placed in a museum with other like monuments. Let’s tell the whole story of the Civil War, not just that of one man who turned his back on these United States. Additionally, the pulling down of these memorials by the public is unacceptable. Mob mentality will only lead to more violence, more injuries, and more death. Let the public officials do the right thing and remove them as a message that this thinking is no longer acceptable in our society. Put them in a museum. But do not destroy them. Destroying them is erasing history, the history that once upon a time, long, long ago, we made some bad choices. We’ve moved on, but here’s what we used to do. They are not going to take the monuments out of the battlefields. Stop those thoughts right now. To even suggest it, from any perspective is pure ignorance. We are a better people than that. Also, stop flying the Confederate flag. Unless you are a re-enactor, there’s no need for it. Where else is the losing army allowed to continue to fly their flag? Nowhere. That would be like flying the Union Jack because we were once British colonies. I don’t see a lot of people doing that. The Confederate flag is not a symbol of heritage. It is a symbol of oppression, hate, racism, and divide. We are the United States of America. I can accept reasonable debate about this subject. A civilized debate is one of the most important facets of our republic. We can respectfully disagree on any subject. Once name calling starts, you’ve not only lost my respect for you, you’ve also lost any credibility you mave have had. Again, we are a better people than that. Craig Bacon is a Civil War buff, and he understands the right place to memorialize that war. That’s why he took the kids to Gettysburg.